Our dedicated team who will see you at every visit. 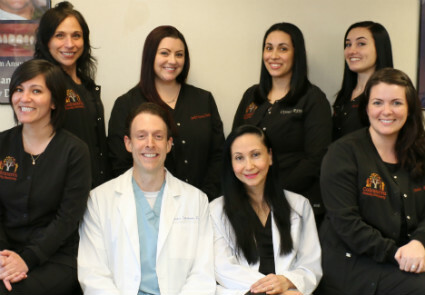 We are a team of dental professionals committed to providing gentle and personalized care to adults and kids of all ages residing in Orange, Woodbridge, West Haven, Milford, and other towns of Connecticut. As a family owned practice serving our community for 38 years, we incorporate modern dental technology into the hands of our caring dentists, hygienists, and staff. With easy parking, convenient hours including evenings and Saturdays, kid-friendly decor, ceiling mounted TVs in all treatment rooms, complementary Wi-Fi, and a great location at the intersection of South Lambert and the Post Road, we make coming to the dentist easy and fun. 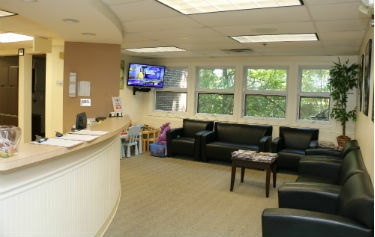 Our spacious Reception Area with plenty of natural lighting and a dedicated Kids Corner. Routine cleanings, oral cancer screening, and other general dentistry procedures. Emergency services such as extractions and root canals. Cosmetic dentistry such as teeth whitening, bonding, non-invasive white spot treatment, porcelain veneers, and all porcelain crowns. Pediatric dental services such as BPA-free sealants. IV sedation dentistry with one of Connecticut’s most experienced sedation dentists. Some of our many Google and Facebook reviews from satisfied patients. We are a family owned office with deep and longstanding ties to the Orange, Milford, and West Haven communities. We always provide up front and honest treatment recommendations – we will never sell nor push unnecessary procedures. We will bend over backwards to ensure you can use as much of your dental insurance in our office as possible. We offer convenient, family-friendly appointment times, with all care being delivered in a modern and clean setting. What more can you ask for? Our modern dental practice uses state of the art sterilization techniques, digital x-rays, ceiling-mounted TVs and computer monitors in every room, and other exciting technologies. Complementary Wi-Fi is available for all patients. New patients are always welcome. We see patients from Orange, Milford, West Haven, New Haven, Woodbridge, Hamden, Ansonia, Derby, Shelton, North Haven, and other nearby towns in CT. Call us today at (203) 799-2929 or visit this page to make an appointment.